Herkybirds nest: How to use my Skirmish (solo rules) system! Hawkeye and Chinganchook lead, with Uncas bringing up the rear. As Hawkeye can see nothing, his Risk Factor (RF) is 0, and as the result is in blue, commanded figures can act as the player wishes instead. The Munroe sisters, in their long skirts are unable to keep up, so stay in cover with Uncas. Now its the turn of 'Les Francaises'. A D6 is thrown for each hidden marker able to see Hawkeyes move. They are all at RF of 0 too, so need a 6 to move. Otherwise they smoke, make Wampum or whatever! So we return to Hawkeyes party, His command rolls total 12 so he is still in command. The Munroes and Uncas do a dainty dash to the rocks while Hawkeye and Chinganchook climb on the rocks, going half speed so they can shoot any hostiles they meet. the first marker spotted is a dummy. So back to the forces of darkness..... still no sixes! - they stay put again! 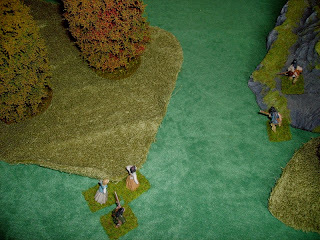 Hawkeye and Chinganchook move slowly round the rocks and run into a small party of Huron! ..and the +1 hit kills him! The Hurons throw a 6 and consult the Action chart, they are +1 RF for 10% casualties and +1 for seeing the enemy. They are not totally in cover against Hawkeye. So at RF of 2, they throw a 6! - Advance and charge if in reach! He is a Hero (+1) facing an extra enemy (-1) but still wins by 1. They both threw a 5+ for an effective hit, but Hawkeye won, and with a 6 kills one of the Hurons! Still in command, Hawkeye rushes another Huron while Chinganchook and Uncas take on another one..
Hawkeye scores a 3 (+1 for Hero) and the Huron a 1 - and is pushed back. Chinganchook gets a 3 but the Huron gets a 5! - that would wound, but he is -1 for facing Uncas too, so Chinganchook is pushed back instead. 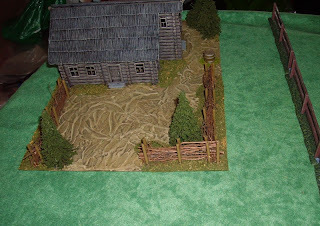 The Hurons throw a 4 at RF6 (-3 for retreating in melee, -1 for losses, -1 for seeing enemy, -1 for Uncas moving on their flank, and they break off to head for cover to their rear. ...and drops the Huron with a 5. The Hurons throw a 1 at RF7 (-3 retreating, -3 10% losses, -1 can see enemy in range) - and scatter! I hope this shows how the system works. There is a degree of interpretation needed at times as can be seen from the melee, Uncas moving round the flank of the cowering Hurons would not normally count as 'Enemy to flank' but in this circumstance I felt it seemed right. Anyway, solo opponents don't complain! If you have any problems still or queries, please contact me via my E-Mail address on the Blog header. I do have several other rules not on there though! If you want to see my Wild West , Crimea - ACW skirmish, Napoleonic skirmish or Border Reaver ones, I will happily PDF them and send them on, just E-Mail me! (Having read the first comment below) -If you want me to try to adapt this system to any area of skirmish gaming not so far covered, I may be able to do so for you, but i will need to have some interest in the period to do it well--- just don't all E-Mail at once! Good stuff, I'm looking for easy, fun skirmish rules like this but for modern/sci-fi, I will go and have a look at the web link.